Beginners that have already studied some English at some point in their life. Most of these learners have studied English at school, many for a number of years. These learners have usually had some contact with English since their schools years, but feel that they have little command of the language and therefore want to begin ‘from the top’. Teachers can usually assume that these students will understand basic conversations and questions such as: ‘Are you married?’, ‘Where are you from?’, ‘Do you speak English?’, and so on. Often these learners will be familiar with grammar concepts and teachers can launch into descriptions of sentence structure and have students follow along reasonably well. These are learners who have had no contact with English at all. They often come from developing nations and often have had very little education. These students are often more challenging to teach as the teacher can not expect learners to understand even a minimal amount of English. The question,’How are you?’, will not be understood and the teacher must begin at the very beginning, usually with no common language with which to explain the basics. With these differences in mind, I would like to make a few suggestions about teaching absolute and false beginners on the following pages. It would be much better (and more comprehensible) to the students if I began the lesson with, ‘Hi, I am Ken.’ and then gesture to the student to repeat a similar phrase. In this way, the student can repeat by rote and begin with something easy which can then lead to something like: ‘Hi, I am Ken. Are you Ken?’ – ‘No, I am Elmo’. By limiting the linguistic concepts absolute beginners can more easily assimilate the pieces. Do not assume familiarity with linguistic conceptsThis is rather obvious, but often ignored by many teachers. If you write a grammar chart – even a simple one – on the board, you are assuming that students are familiar with grammar charts. Students may not have had the type of education that involves charts and representations. By keeping things aural and visual (gestures, pictures, etc.) you will be appealing to learning styles that students are sure to have acquired in everyday life. Use exaggerated visual gesturesUsing gestures such as pointing to yourself and saying, ‘I am Ken’, and then pointing to the student to repeat helps students understand what you want of them, without confusing them by more language such as; ‘Now, repeat’. Develop specific gestures as codes for certain linguistic operations. For example, to illustrate the idea of inversion in the question form you can extend your two arms and say, ‘My name is Ken’ and then cross your arms and ask, ‘Is your name Ken?’, this gesture can then be repeated as linguistic skills become more advanced and the students will understand that a question needs to be asked. For example, ‘I live in New York‘ and then cross your arms and ask, ‘Where do you live’. When a student makes a mistake asking a question, you can then cross your arms and the student will understand that he / she needs to invert in order to ask a question. Try to pick up a few phrases of the learner’s native tongueThis is purely a psychological trick. Learners – especially adult learners – who are learning English with no prior experience are not only undergoing a difficult learning experience. In many cases, they are also learning how to learn a language. If you put yourself on the line by expressing the desire to learn a few phrases of your students’ native language, you can go a long way towards building a rapport with students which will help them feel more at ease in class. 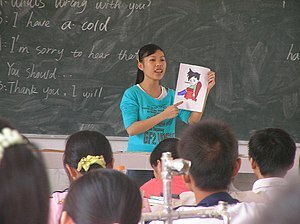 False beginners will all have had some English training at some point in the past and this can cause some special problems. Some learners will really know more than they admit and, with the passing of time, might become bored with some of the basics. Different levels can quickly create tensions between learners, as those who know more can become impatient with others who require more time. Some learners might be false beginners because of inherent learning problems. Give more advanced learners more difficult tasks.– For example, when asking questions of students ask the more advanced learners questions beginning with ‘Why’ which will require a more advanced response. Give more advanced learners extra work in class and at home. – By having a few extra tasks at hand you can bridge the gap that is often created when those who are faster finish earlier. If more advanced ‘false’ beginners become impatient don’t hesitate to ask them something that is over their head. – This might be a little harsh, but will work wonders! Remember that things will eventually even out after the first few weeks. – Usually, ‘false’ beginners are there because they really do need to review from the very beginning. This implies that sooner or later all of the learners will be learning something that is truly new for them and problems with impatience will quickly disappear. If a learner is a false beginner because of learning problems, you will need to consider different learning styles – People learn in different ways. If grammar explanations, etc. are not helping a particular learner, you can help that learner with visual, audio and other methods appropriate for different learning styles. For more information on different learning styles take a look at this feature. Your students will have basic familiarity with linguistic concepts. – False beginners have all studied English at school and will therefore find things like conjugation charts and timelines useful. Standard themes will probably be familiar. – Most false beginners are comfortable with basic conversations such as: ordering food in a restaurant, introducing themselves, talking about their immediate family, etc. This will give you a good starting point on which to build when beginning your course and getting to know your students.